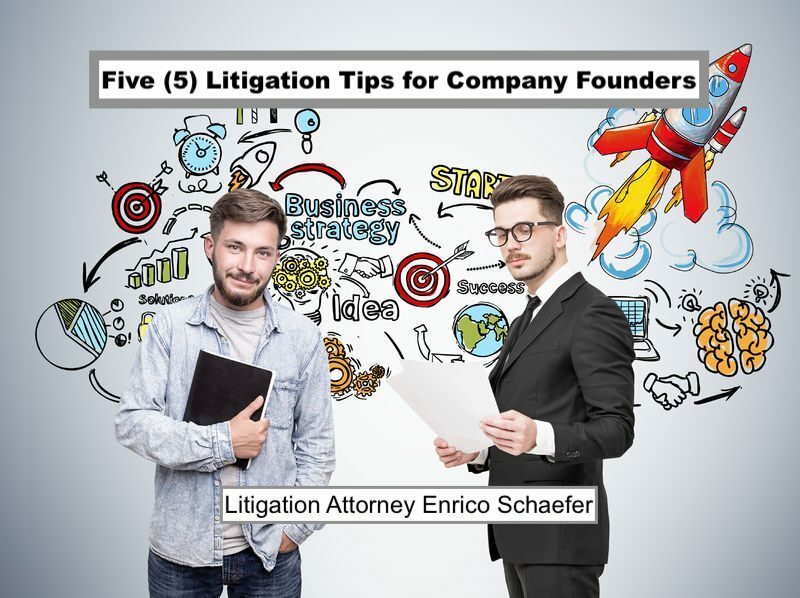 Complex litigation attorney Enrico Schaefer shares five (5) tips for company founders and business owners. Watch the video below. How to document your litigation strategy by identifying and prioritizing specific goals. Litigation is a five lane highway. Don’t let your trial attorney drift from shoulder to shoulder, billing hours and wasting time. Pick a lane and stay in it. Your lead trial attorney is the captain of the ship. There can only be one captain. Compromise on strategy rarely works. (see ‘pick a lane’ above). Leave your emotions on the sidelines. Make smart business decisions. Your attorney should never play into your emotions, but instead make sure you are making rational decisions, and pushing back as necessary. Attorneys who add fuel to your emotions, are typically just looking to bill more hours. Filing a lawsuit is not simply filing paper in court. The soft cost of litigation can be the most expensive item. Be ready to provide time, money and resources to your attorney, making sure you are always providing everything required and getting the facts 100% complete and correct. One fact, one email one document can turn a winning case into a losing case. Make sure your attorney knows everything and let the lawyer judge what is, and is not, important. Welcome to Founder’s Friday, my name is attorney Enrico Schaefer. I am a litigation attorney in technology specializing and founder representation at the law firm, Traverse Legal. We are a national law firm, handling clients across the globe on complex litigation, intellectual property and tech matters. Today, we are going to be talking about something that is a little unusual, but for founders of companies, you are the ones that have to make really strategic decisions about a number of different things, including litigation. Sometimes litigation becomes inevitable. It’s rarely something that companies and founders are looking to become involved in, but it can be something that comes across the path and you have to deal with it. So today, I want to talk a little bit about how to deal with the prospect of litigation from the founder’s point of view, from the person that owns the company that started the company that has all of the sweat equity into the company. Now, litigation is something to be avoided if at all possible in most circumstances. It is costly, it’s expensive and it takes a tremendous amount of resources in order to pursue. If you are trying to make a decision as to whether or not to be a Plaintiff in litigation, that is an easier position to be because you get to choose whether or not to file that complaint or not. If you are the target of litigation or the Defendant, the choice can sometimes be removed because you are being sued and at that point have no choice but to step up and deal with the situation. Now, litigation is very much an art. It is much more than filing paper in Court and asserting positions. It is, at its core, an exercise in strategy. There are a thousand ways to skin the litigation cat, and your choice in counsel is going to be dependent in part upon the strategy you look to pursue. Now some attorneys simply go through the motions and there is litigation so you respond to the complaint, you go through the paperwork, and you deal with the Court filing dates. What I find is missing in all too many cases is an initial documented strategy. That is where you take a look at the entire playing field, both your claims, the leverage you can assert, the leverage against you, you take a look at the other side and you give an analysis what kind of company they are. Are they overly litigious? Or litigation adverse? And you develop around the facts, the parties, the people involved and develop a strategy. Are you looking for money? Are you looking to get some non-financial consideration? Are you looking to litigation for a long time? Are you looking to get in and out quickly? Whatever your goals are, those should be spelled out and documented at the very beginning of the lawsuit, because a good attorney will not simply go through the motions. A good attorney in litigation will accomplish your goals. So list your goals, which they are different for every single company. After you list your goals, then you prioritize them. One through five. What is the most important thing? What is the second most important thing? Once you have done that, a good attorney can actually use all of the attorney’s brain power, experience, the law, the facts, the legal and non-legal leverage, and then spin that into a result. If you do not document your strategy, then you will not likely achieve your goals. I often say that the practice of law and especially litigation is like a five lane highway, and an attorney can on an hourly billing basis can drift from shoulder to shoulder. They are still on the highway but are they really getting you where you want to go? It is all legitimate billing from here to here, but what you really want is a focus. Pick lane and stick to that lane. If there is something that changes in the course of the case, you can choose strategically and after discussion to change lanes. But you want a very narrow focus, a very strategic focus to your case. The third thing I want to talk about is the team that you put in place. The team is going to include both the litigation attorneys and the internal resources you provide in order to get the information and make the decisions. The team you put together is critical. Now, you are going to have to have one person in charge, which typically is going to be the lead or first chair trial attorney, and this is really important. You cannot do litigation by consensus. It does not work. And the reason why it doesn’t work is this: at every juncture there are dozens and dozens of ways that an attorney can handle a phone call from the other attorney. Can handle whether to file a particular document with the Court and what is the primary message of that document? And at every given point in the case, there are all these nuance decisions that need to be made. Those are going to come from your trial attorneys’ instincts, from their experience, or from their gut, sometimes. And what you don’t want is to lose that experience, lose that nuance which that attorney brings to the table because there is all these different people, all these different cooks in the kitchen. That will be counterproductive. Make sure that your lead trial attorney and everyone on the team understands that they are the final decision maker. Sometimes you just don’t have time to debate what happens next. The next thing I want to talk about is the fourth thing. We have talked about strategy, we have talked about the five lane highway, we have talked about team and the fourth thing is emotions. There is no question that litigation can be extremely emotional because of what is at stake, because people are saying things, people are in many instances lying and what you want to avoid is to have an emotional response to a particular situation. You want to make sure that you are taking a look at it from a business or founder’s point of view. Does this make sense? What is the return on investment? What am I achieving? What were those goals that I set forth, documented and prioritized? Does this advance me towards those goals? If you want an outcome, everything should be filtered through that outcome. So leave your emotions on the table. A good trial attorney handling your litigation will check your emotions at every point. Will make you put those emotions to the side and deal with things from a strategic or business point of view. The fifth and last thing I want to talk to you about is this notion that litigation is going to the courthouse and filing papers, and that it is a simple process. Every founder of every company, whether you are a start-up company or a founder of a mid-tier company that has that $1 to $3 million dollars in revenue or a founder of a company that is hitting $100 million in annual gross revenue and more, you need to understand this, litigation is complex, it is variable, it is hard to predict and it is much more that filing papers. The resources that will be required from your company in terms of time, in terms of distraction, and in terms of emotion is going to be ultimately higher than you could ever anticipate. A lot of time founders and company owners refer to this as the soft cost of a particular matter. The soft cost of litigation is extremely high. So all that time you are going to be spending on the litigation is time you are not going to be spending pursuing your business. It is going to be time that you are not being strategic about what comes next in your business. So you have to account for that and you have to be accepting of the fact that if you do not being the resources that your litigation attorney requires to the table, if you do not get your lawyer who is handling the case the information that they need, or if the information isn’t absolutely accurate in every way, then you should not be bringing that litigation case. You have to understand resources are important and you, the founder, and the company are going to be a very important resource to win the case. My name is trial attorney Enrico Schaefer and that is what we have for today on Founder’s Friday. Good luck, stay safe and if you can, stay out of court.